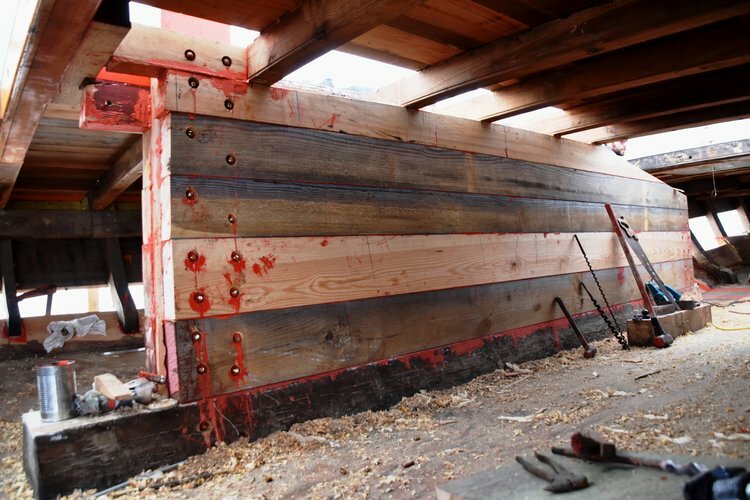 Chesapeake Bay Maritime Museum Shipyard Manager Michael Gorman reports much work has been done over the winter on the log-hull restoration of Edna E. Lockwood. Queen of CBMM’s historic fleet of Chesapeake boats and a registered National Historic Landmark, the 1889 log-bottom bugeye is the last of her kind and set for re-launch at CBMM’s OysterFest in St. Michaels, Md. on Saturday, October 27, 2018. Edna’s new log bottom has been permanently fastened to the original topsides with bronze bolts, each made from scratch out of ½-inch bronze rod, with soldered nuts and washers forming the head. CBMM shipwrights and apprentices will fabricate more than 300 bolts when the restoration is complete later this year. Shipwright James DelAguila led new shipwright apprentice Zach Haroth in fabricating Edna’s new centerboard case. The case’s 4-inch thick sides were pinned every 18-inches with bronze, in the same manner that Edna’s logs are held together. The inside of the centerboard case was also lined with more than 200-feet of 16-gauge copper, for antifouling and preservation purposes. Seip Family Foundation second-year apprentices Michael Allen and Spencer Sherwood have teamed up to install Edna’s new double-sawn frames and mast steps. Made of White Oak and bolted with custom bronze bolts, the frames and steps keep the masts in place and handle tremendous loads when the bugeye is underway. Planking Edna has begun in earnest—all rotten hood ends have been staggered back, and the inner stem and sternpost replaced—thus the gap between old and new will be closed. Shipwright Joe Connor will be handling the stern, while Gorman will plank the bow, with the work of the two meeting in the middle. All new planking will be sawn out of the leftover Edna logs. With the end in sight, Edna’s new sails have been ordered, with an estimated arrival date of August 1. Traditional Rigging Co. of Appleton, Maine, has been selected for their specialty in period sailmaking and handwork. Traditional Rigging Co. has also agreed to document the sailmaking process, with photos and progress reports posted on ednalockwood.org. Next up for the team is constructing new cabin houses and hold hatches, with all work being done in full public view, now through October. A new deck beam will need to be made and king plank reinstalled, now that the centerboard case is completed. Once the planking and final fairing is completed, sanding and painting will finish off the project. To learn more, visit the Chesapeake Bay Maritime Museum on the Miles River in historic St. Michaels, Md., or at cbmm.org.